Don't forget about K-Youk. They shared MVP status Sunday, in my opinion... can't wait for tonight! Totally agree about Youk. He continues to be overlooked and undervalued. Not only in Boston, but throughout the league. I think he'll be on the short list of AL MVP candidates by the end of the season. 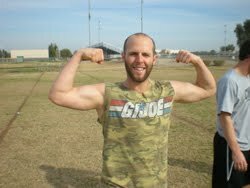 ...but he doesn't have Pedey's massive guns.